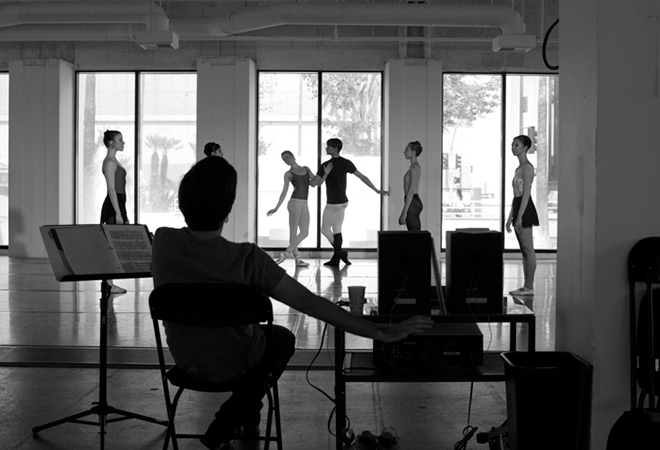 Dancers with American Contemporary Ballet are channeling Fred Astaire for six performances on Friday, Saturday, and Sunday, reprising a program that debuted during the spring at their Wilshire Boulevard studios. This time the Music+Dance:LA production, in association with the Da Camera Society, contains four, not two, Astaire tributes in addition to an original Astaire-inspired piece from artistic director Lincoln Jones and a new ballet set to the music of Bohuslav Martinů. Afterward there’s live jazz and a reception with the artists. We spoke with Jones and three of his dancers. Your Fred Astaire program in April featured Dancing in the Dark and I’m Old Fashioned. How did the audience respond? Lincoln Jones: The response was tremendous. We sold out so far ahead of time, we added an additional show, and that one sold out in a day or so. So many people seemed to have been deeply affected by Astaire and were thrilled that we were doing the program. A lot of people also seemed really blown away by how fully our dancer Zsolt Banki was able to adopt his style. A lot of people had doubts that a folk dancer from Hungary could do a good Astaire, but it comes really naturally to him. Why did you decide to add Oops and All of You to this June program? How do these two pieces help explain Astaire’s choreography and artistry? LJ: I wanted to find a balanced program and to show Astaire’s range. I’m absolutely in love with All of You, both the music and the dance. In it Astaire plays a film producer who is in love with a beautiful but ideological Soviet agent. The way he breaks her down in the dance and unleashes her natural desire—to me it’s just spine tingling. It’s one of the most romantic things I have ever seen. Oops is hilarious, so it really rounded the program off well. It seems simple, but it is ingeniously crafted. What is the casting for each of the four Astaire re-creations? LJ: Zsolt Banki plays Astaire for every number, and Theresa Farrell and Cleo Magill will reprise their roles [Theresa in Dancing in the Dark and Cleo in I’m Old Fashioned]. They both did a tremendous job assimilating the details of Cyd Charisse’s and Rita Hayworth’s performances. Cleo really captures Hayworth’s effervescence, and Theresa projects Charisse’s cool reserve. Oops will be danced by Crystal Serrano, who joined the company last year. She and Zsolt work so well together. There is both subtle and not-so-subtle comedy in Oops, and they get both just right. Alisha Brach, who is new to the company this year, will dance Charisse’s role in All of You. Alisha has a natural grace that is really magnetic, and I love the way Zsolt pursues her in the number. These pieces originally appeared on the big screen in the ’40s and ’50s. How will you familiarize your audience with these scenes so they have some context? LJ: The scenes that precede these dances are all so funny, I thought rather than including program notes, we should just do the scenes. I’d never hired actors before, so I called Jane Kaczmarek, a great actress, friend, and patron of the company, who put me in touch with Jeanie Hackett, a director and coach, who sent us actors and actresses to audition. They weren’t easy parts to cast. On the one hand, you’ve got to find a girl who can pull off roles originally played by Rita Hayworth, Cyd Charisse, and Vera-Ellen, and on the other, you’ve got to find Fred Astaire. Of course it helped that he didn’t have to dance. I’m so pleased with who we found. Our actress, Callie Schuterra, blew us away from the first scene of her audition, and our Astaire, Rob Norton, has an inherent lovability, which I think was essential to Astaire’s appeal. It’s an unusual combination—actors and ballet dancers doing scenes from Hollywood’s golden age—but it really made something special. What can the audience expect to see in your original Astaire-inspired piece, and from your new ballet set to the music of Bohuslav Martinů? LJ: My purpose in creating the number was to learn from Astaire, which I definitely did. Of course, it is also frustrating, because I look at it in comparison to Astaire’s work and see all the things I didn’t do and could do better the next time around. One of the most enjoyable parts of the process, though, was creating an original dance arrangement of a tune from an Astaire film, It Only Happens When I Dance With You (Easter Parade). Peter Myers and Luanne Homzy, L.A-based musicians who also play in the show (cello and violin, respectively), did a tremendous job with it. New company member Anais Blake dances the role, and there is something in how she moves that I really like. I am very excited about the new Martinů ballet. You can hear the influence of Czech folk music throughout the piece, and I used Czech folk dance as a starting point, so the dance has a grounded, rhythmic feel. Martinů isn’t the most well-known composer, but this is a tremendous piece of music, with some of the most exciting rhythms and beautiful, lyrical melodies I’ve ever heard. One of the melodies in the third movement just wouldn’t leave my head. I’m excited that new people will be discovering him. Alisha Brach dances the lead in the ballet, and her partner is Colby Parsons. Colby is an L.A. native who recently returned after three years with the Alberta Ballet. He is a very strong dancer and a joy to work with. We’re fortunate to have him. Theresa, we noticed that your performance of Dancing in the Dark in April required a lot of restraint (a super-straight back) while at the same time a softness and fluidity. How do you balance the two as a dancer? Theresa Farrell: Classical ballet trains you to do that—maintaining stillness, and a sort of rigidity, while still being supple. Charisse’s character is a ballet dancer, and Dancing in the Dark begins by emphasizing the difference in her style to that of Astaire’s character, who is a tap dancer. But because it is an Astaire number, everything is ultra-smooth, so the rigid/smooth contrast was really high. I got tendonitis in my knees trying to achieve it, but Lincoln said that my classical dancing improved as a result. How does partnering in a traditional ballet compare to partnering in an Astaire piece? TF: The Astaire partnering is so refined, I really have to listen to my partner. I’m fully engaged with him. It is the epitome of “dancing together.” In ballet, because the moves are very technical, I’m often just focused on getting what I need from my partner so that I am able to balance, turn, etc. It’s made me aware of how much more I can do with my ballet. Zsolt, in April you performed the role of Fred Astaire in both Dancing in the Dark and I’m Old Fashioned. In the first, you exhibited more control; in the second, a lively spirit. How did you prepare for these different roles? Zsolt Banki: For me, the challenge with all of Astaire’s choreography is combining the precision of his rhythm with his impeccable fluidity. This was especially challenging in I’m Old Fashioned because of the speed, but it can be difficult in the slower movement, too, as in Dancing in the Dark, because it takes so much control. The preparation for both was lots of practice. Lincoln would continuously refine our rhythm to make it more accurate and our style to make it more authentic, and then we would practice our partnering so that we knew intuitively where every hand and every foot would be at each moment. How do you feel performing as Fred Astaire? ZB: It was intimidating at first. It felt impossible to step into the shoes of such an icon. But he is also incredibly inspiring. I am amazed at how he achieves such fluid perfection in such a diversity of movement styles. Nothing feels better than dancing these steps. Cleo, from a dancer’s perspective, were there any challenges in preparing for your role in I’m Old Fashioned? Cleo Magill: One of the challenges I faced was adjusting to Astaire’s style of choreography. You constantly have to be ready to go in any direction, at any speed, and make it look smooth. Also, Rita Hayworth danced in heels, which took me time to get used to. I spent a lot of time practicing with the metronome. I wanted to achieve perfect rhythm, like a great tap dancer. My ultimate goal was to make music with my steps. I would also come into the studio early so I could practice my upper body and expression in the mirror. I really wanted to capture Rita’s elegance and joyfulness but at the same time add my own personality and flavor to the dance. Your dress, hair, makeup, and huge smile seemed to bring Hayworth to life. How does it feel to perform in her footsteps? CM: It was like a dream! That weekend in April was honestly one of the happiest weekends of my life! There is something so special about these Fred Astaire dances. They make you feel so free. I felt I could completely trust my partner, Zsolt, which created a connection that made me feel as if we were one.